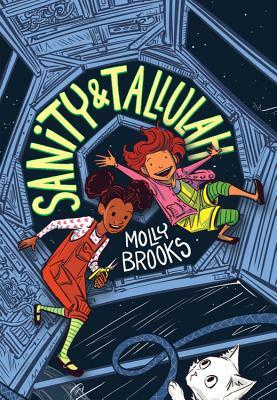 Molly Brooks launches the delightful adventures of space-faring BFFs Sanity & Tallulah with this vastly entertaining middle grade graphic novel. Resources are limited and valuable on their home space station; therefore, Sanity’s creating an amazingly cute three-headed kitten (Princess, Sparkle, Destroyer of Worlds) is definitely against the rules, even before Princess, Sparkle, Destroyer of Worlds escapes, endangering their family, friends, and everyone else on the station. Molly’s illustrations and text have the assurance of an established creator, even though this is her debut. Recommended for fans of Zita the Spacegirl, Phoebe and her Unicorn, and budding scientists! Sanity Jones and Tallulah Vega are best friends on Wilnick, the dilapidated space station they call home at the end of the galaxy. So naturally, when gifted scientist Sanity uses her lab skills and energy allowance to create a definitely-illegal-but-impossibly-cute three-headed kitten, she has to show Tallulah. But Princess, Sparkle, Destroyer of Worlds is a bit of a handful, and it isn't long before the kitten escapes to wreak havoc on the space station. The girls will have to turn Wilnick upside down to find her, but not before causing the whole place to evacuate! Can they save their home before it's too late? Readers will be over the moon for this rollicking space adventure by debut author Molly Brooks. Molly Brooks is the illustrator of Flying Machines: How the Wright Brothers Soared by Alison Wilgus, and many other short comics. Her work has appeared in the Village Voice, the Guardian, the Boston Globe, the Nashville Scene, the Nib, the TOAST, BUST Magazine, ESPN social, Sports Illustrated online, and others. She spends her spare time watching vintage buddy cop shows and making comics about knitting, hockey, and/or feelings, which you can see on her website (mollybrooks.com). Molly lives and works in Brooklyn.